India is a land of mysticism, spirituality, religion and beliefs. From centuries, people have been building, visiting and praying in temples, shrines and various other places of worships. There are countless temples in India and while the origins of some of them date back to centuries ago, for some it is even unknown. A few of such ancient temples are in Uttarakhand, where the annual Char Dham Yatra happens around this time of the year. The Char Dham Yatra is the biggest of a pilgrimage tours in India. Char Dham refers to four holy sites or abodes of the Hindu deities. The four Dhams are Kedarnath - dedicated to Lord Shiva, Badrinath - dedicated to Lord Vishnu, Gangotri and Yamunotri - dedicated to Goddesses Ganga and Yamuna, respectively. The sacred sites of these temples also mark sources of the four holy rivers that originate in the glaciers of Himalayas - Ganga from Gangotri, Yamuna from Yamunotri, Mandakini from Kedarnath and Alaknanda from Badrinath. The actual glaciers are a little further ahead from the sites of the temples (for everyone's convenience); however, every year, adventurers and trekkers often trek up to the glaciers. Another remarkable feature of these sacred sites is that the region has numerous natural hot water springs. The ones in the vicinity of the temples are known as Tapt Kund. These constantly flowing, hot springs of geothermally heated water are rich in mineral content and are known to have therapeutic values. At some places, where the temperature is incredibly low, these hot springs run parallel to the chill glacial melts. And it is amazing to experience the striking contrasts of temperatures. The Kapat or doors of the four ancient temples open in April end/May, as the winter snow starts melting to feed the sacred rivers of the region. May through June is the best time to visit the Char Dhams. The region receives heavy rainfall during the monsoon months and devotees seldom visit during this period. Post monsoon, however, there's a dramatic rise in the number of visitors. Hordes of people visit the Dhams every day and the numbers keep increasing nearing the temples' closing times. The temples close in the month of October/November around the Diwali festival, and as the season's first snowfall begins. The temples remain closed and snow-covered throughout the winter months only to be opened in the following Spring. The residents of temples and nearby villages migrate to lower altitudes during this period. When the temples are opened after six months, the flames of oil lamps that are lit while closing the temple are still found to be alive and burning. It is a belief that Bhairav - a fierce manifestation of Shiva, guards the temples during this period. Customised tours are arranged by the Uttarakhand Government as well as by the private tour operators. As the Char Dham Yatra is a huge affair, plenty of travel and stay options are available throughout the state. As each year the number of visitors increases and since the temples are open only for a certain period, it is advisable to plan and book the travel in advance. In general, it takes 10 days to comfortably complete the Char Dham Yatra by road. Those with time constraints or who do not mind spending extra bucks can opt to complete the yatra by a helicopter. However, it must be kept in mind that the weather in the mountains is volatile and the chopper services may be canceled anytime due to bad weather. It is a believed that the auspicious yatra should be undertaken from West to East, in a clockwise direction. Therefore, visitors start the Char Dham Yatra from Haridwar or Rishikesh to proceed to Yamunotri, Gangotri, Kedarnath and Badrinath, in that order, with halts at villages/towns in transit. The entire Char Dham circuit is approximately 1300 km covered in a span of 10 days. Book the stay, travel, helicopter tickets (if availing the service) in advance to avoid any last-minute hassle. It is mandatory to register yourself for the Char Dham Yatra for safety purposes. Several registration offices/counters for the same are set up by the Uttarakhand Government along the yatra route. Biometrics issued after the registration helps officials track the number of visitors and can also be used to avail government facilities like stay and food. There's a huge variation in temperatures throughout the route. While the temperature at the starting points like Haridwar is warm, it drops drastically as you gain altitude. The temperature in Kedarnath and Badrinath tends to drop to subzero levels with sudden and cold torrential rains. It is, therefore, advisable to pack warm sweaters, jackets, thermals and rainproof clothing along with some light and quick drying clothes. Road conditions aren't always great throughout the route and some areas are prone to landslides. Care must be taken to drive safely to start and reach early. As you gain altitude, especially in Kedarnath and Badrinath, air tends to get thinner. Camphor is known to help people with breathing problems, at higher altitudes. Perched atop the Bandar Punch Parvat, at an altitude of 3291 m, Yamunotri is the abode of goddess Yamuna. It is the westernmost shrine of the Char Dham Yatra and devotees start the yatra by visiting this site first. Yamunotri is the source of the sacred river Yamuna that originates here, though the actual glacier is located further ahead and is not easily accessible. A motorable road till Janki Chatti can be taken, after which, one can trek the 7 km or avail the services such as a pony ride or doli (palanquin) to reach the temple. The route can be traversed comfortably, as it has lots of shops, small restaurants, drinking water faucets, temporary washrooms, resting sheds, etc. The Gangotri Temple is dedicated to goddess Ganga who took the form of a river to wash away the sins of King Bhagirath's ancestors. Known as Bhagirathi here, the river is later known as Ganga, as it cascades down from here. The holy river originates at the Gaumukh glacier, which is located about 18 km further ahead from the Gangotri temple. Many enthusiasts trek to the glacier each year and it is known to be one of challenging treks. The temple is situated at an altitude of 3100 m, and a well-maintained motorable road can be taken to reach the site. From the parking, one has to walk a few hundred metres to reach the shrine. A place called Gangnani, which is 50 km before Gangotri, has natural hot water springs. Devotees stop at this place first to take a holy dip before proceeding to the Gangotri temple. Dedicated to Lord Shiva, the Kedarnath temple is the most popular amongst the Shiva temples in India. It is believed that since Shiva is a hermit, his abode in Kedarnath is the remotest of all. And truly, the shrine situated at an altitude of 3584 m near the Chorabari Glacier in Garhwal Himalayas, is not easily accessible. The open views of the snow-clad mountains surrounding the temple, makes it look breathtakingly beautiful. The river Mandakini originates in its vicinity, adding to the beauty of the landscape. 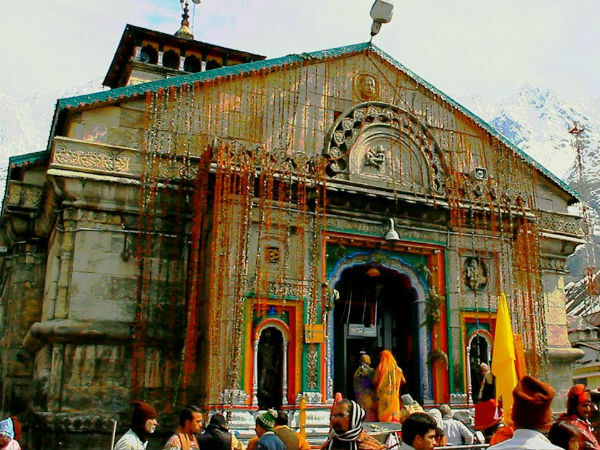 The ancient Kedarnath temple was built in the 8th century by Adi Shankaracharya. It is believed to be built at the same place where once an ancient temple built by the Pandavas stood. The holy shrine of Kedarnath can be reached by trekking a steep, tiring, 16-km long climb. Other options available are helicopter, pony, palanquin and pittu (you will be carried in a basket on the back of a person). Stay options are available near the temple, on the summit. The Badrinath temple is dedicated to Lord Badrinarayan, who is an incarnation of Lord Vishnu. It is one of the most sacred temples for the Hindus. Like the Kedarnath temple, the Badrinath temple is also an ancient temple built by Adi Shankaracharya in the 8th century. There's a Tapt Kund, or natural hot water spring, in the premises of the temple, where devotees take a holy dip before entering the shrine. The Himalayan river Alaknanda originates from the confluence of Satopanth and Bhagirath Kharak glaciers, further up from the Badrinath town. It is believed that the Pandavas travelled through Badrinath and Mana village, which is 3 km from Badrinath, on their journey to heaven. Mana is also known to have a cave temple, where sage Ved Vyas wrote Mahabharata and the four sacred Vedas.